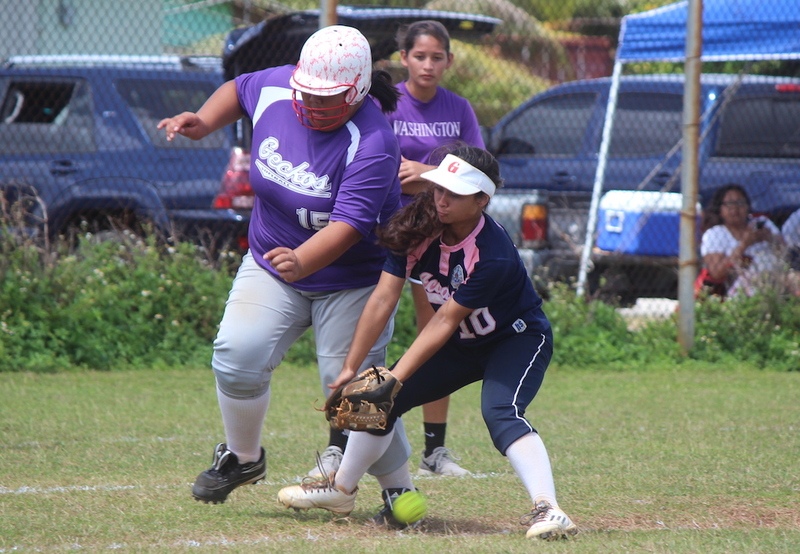 The opening round of the girls softball playoffs began Saturday morning with four games between eight teams dominating the day. The closest match of the day came between the 3rd seeded Cougars and 6th seeded GW Geckos. Academy escaped a late 7th inning rally from the Geckos to secure a semifinals spot, getting a close 6-3 win. Academy opened their playoff run with a strong 1st inning, posting three runs for a quick 3-0 lead all the while going through their full batting rotation. The Cougars scored two more runs in the 2nd inning to quickly take a 5-0 lead. Kiara Rivera and Doriaun Calvo scored the two runs in the bottom of the 2nd inning. GW didn’t go down quietly after coming alive at the top of the 4th inning, getting two runs off hits from Jojo Camacho and Janelle Lujan. A Gecko error in the bottom of the 6th put GW in a must-score situation at the top of the 7th inning, trailing 6-3. With one out away, Geckos Lujan hit a single to spark a GW rally. Next in the lineup, Jackie Toves smacked a deep ball left field that rolled outside the fence for a ground-rule double, negating what could’ve been two big points for GW. A single by Marcy Pangelinan brought in Lujan and a walk later loaded the bases for the Geckos. A timeout was called to settle down Cougars Ashley Mendiola where the game would end on an infield fly from GW’s top of the rotation Carina Cruz. The Cougars will face the Guam High Panthers next Wednesday for a shot at the title while the JFK Islanders will play the Sanchez Sharks. Both games will be played at the Okkodo Field.